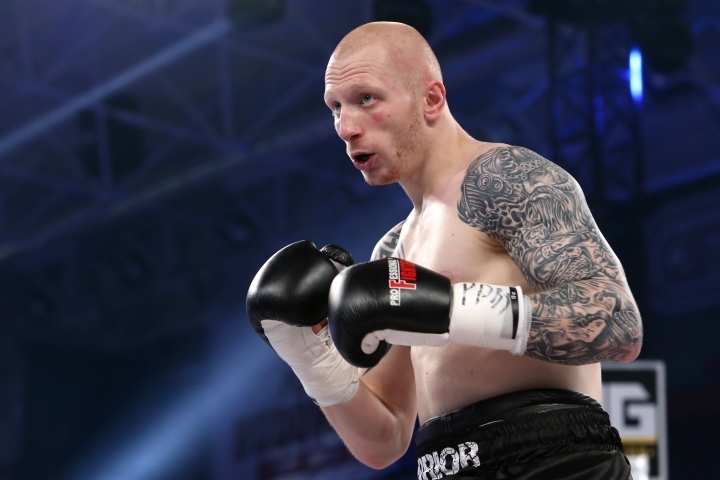 Poland – Robert Parzeczewski (23-1, 16 KO) claims that his job is to knock his opponent out. And tonight in Katowice, he did his work exemplary, knocking out the once-excellent Dmitry Chudinov (21-5-2, 13 KO) in the second round and capturing the international Polish championship at super middleweight. Parzeczewski looked very good in the opening round, using the advantage of his physical conditions and accurately stopping any attacks while seeking to perform at the distance with counter-attacks, of which he could especially throw the left hook. It was clearly visible that Chudinov had already had his best years, but he still has great experience. I do not think anyone expected the end to happen so soon. In the second round, Parz?czewski found the right shot, after which the Russian fighter fell to mat and although he stood up at the count of “8”, he was clearly on his way out. The Polish puncher moved forward, trying to finish the work of destruction, but Chudinov used his experience to survive off the ropes. Not for long, however. When he managed to move the fight to the middle of the ring, the Pole let his attack loose and he connected with his powerful right hook to Chudinov’s head. Although Chudinov once again went down and struggled hard to get off the mat, referee Arkadiusz Ma?ek had no choice and rightly ended the fight. The triumphant Parzeczewski, in an interview with Mateusz Borek after the fight, announced the change of the ring nickname to “Mr KO”.